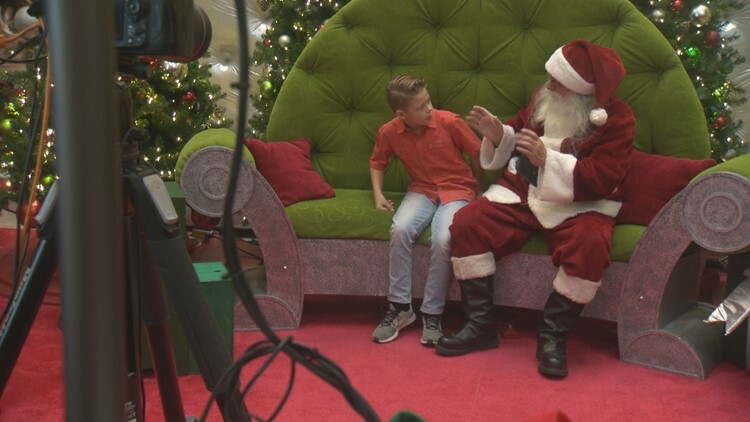 Every deaf kid there was able to sign with Santa and communicate with him at the Austin mall. AUSTIN — Getting your picture taken with Santa is a special moment for any kid and something everyone should get at least once. Most of the time, the mall will bring back those memories. The lights, the music, and yes -- Santa. But on Wednesday at the Barton Creek Square Mall in Southwest Austin, the Santa there wasn't quite 'Ho Ho Ho'ing, but rather signing. "That's the only way they can tell Santa what they want," said Diana Melcer with the Austin Optimism club. "Especially as deaf kids, being able to talk directly with Santa in their native language of sign language," signed Trudy Zhang, who is deaf and has a deaf child. Every kid there was able to sign with Santa and communicate with him. The Austin Optimism club helps put on the event with the school of the deaf in Austin. They've been doing this for the last 24 years and it means a lot for the parents. "This is the only one I know of. It happens once a year on one day from 4 p.m. to 8 p.m. and it's on an annual basis," signed Zhang. "It's a special day, a special time of year." Each child gets to go up to Santa and have their photo taken. They also get a stocking with a small stuffed animal and candy cane. It's these special moments of meeting Santa that mean so much. "It doesn't matter the nationality, the speaking or hearing impaired, we're here for all the children," said Melcer. Because every kid deserves to talk to Santa.